Director/Screenplay/Producer – Hayao Miyazaki, Based on the Novel by Eiko Kadano, Music – Joe Hisaishi, Animation Directors – Katsuya Kondo, Yoshifumi Kondo & Shinji Otsuku, Art Direction – Hiroshi Ono, Planning – Hideo Ogata & Tatsumi Yamashita. Production Company – Studio Ghibli. The young witch Kiki has turned thirteen. On the night of the full moon, she sets out on her broomstick accompanied by her black cat Jiji to complete her apprenticeship in the wider world, as all witches must do at her age. She eventually comes to the town of Kokiro. After experiencing difficulty and wondering if this might be the wrong place to set up, she is offered a room by the baker Osono. Reasoning that her only skill is flying, Kiki comes up with the idea of creating a delivery service, flying to each destination on her broomstick. However, after she befriends and engages in a tentative romance with Tombo, a boy her own age, Kiki begins to discover that this is causing her to lose her abilities and that she can no longer fly or talk to Jiji. Hayao Miyazaki is one of the great names in anime. Miyazaki began working in television and made his directorial debut with the slapstick caper comedy The Castle of Cagliostro (1980). Miyazaki’s strengths began to grow with his next films Nausicaa in the Valley of the Wind/Warriors of the Wind (1984) and Laputa: Castle in the Sky (1986) – beautifully animated science-fiction works that are filled with Miyazaki’s passionate empathy for nature and the environment and contain contrasts of scale that are completely stunning. With My Neighbor Totoro (1988) and Kiki’s Delivery Service, Miyazaki made films that showed him as an unparalleled master of the genre – both films being gently affecting children’s fables that come with an extraordinary tenderness and emotional strength. Subsequently, Hayao Miyazaki made the often overlooked Porco Rosso (1992) and then with Princess Mononoke (1997) was suddenly discovered in the West. This was consolidated by Spirited Away (2001), which won the Academy Award for Best Animated Film in 2002. After this point, people begin to clamber for Miyazaki’s back catalogue. Subsequently, Miyazaki has made Howl’s Moving Castle (2004), Ponyo on a Cliff By the Sea (2008) and The Wind Rises (2013), as well as to write/plan Arrietty/The Secret World of Arrietty (2010) and From Up on Poppy Hill (2011). The Kingdom of Dreams and Madness (2013) is also a documentary about Miyazaki and Studio Ghibli. Kiki’s Delivery Service has all the recurrent motifs of a Hayao Miyazaki film – the soft tenderness and emotional complexities of the lives of young girls; the placid pastoral settings; the love of archaic or oddball flying machines. All the backgrounds are drawn with a simplicity and extraordinary depth of detail. Hayao Miyazaki’s films often seem to be taking place in an almost familiar alternate world. Here Miyazaki has seemingly crafted the town of Kokiro as though it were somewhere in rural France – though the faces are Asian, there are even gendarmerie in the village. (In actuality, the artists went to locations in Sweden to model the backgrounds – apparently inspired by a visit there by Miyazaki in the 1970s in a failed attempt to obtain the film rights to Pippi Longstocking from Astrid Linndgren). There is often a striking resemblance between Hayao Miyazaki’s animation and the work of Tintin creator Hergé – both in the love of pure-hearted adventure, the clean lines and the depth of detail that either artist places into the backgrounds (the ligne claire style). Of particular note here is Hayao Miyazaki’s fondness for flying machines – something that turns up in a number of his films, Nausicaa, Laputa, Porco Rosso and especially The Wind Rises, the biography of a Japanese airplane designer – be it Kiki flying on her broomstick, Tombo building a bicycle with a propeller on the front of it or the giant dirigible. The film culminates in a fabulous finale filled with breathless suspense and enthralling, massively scaled action where Kiki must conduct a rescue from the dirigible. 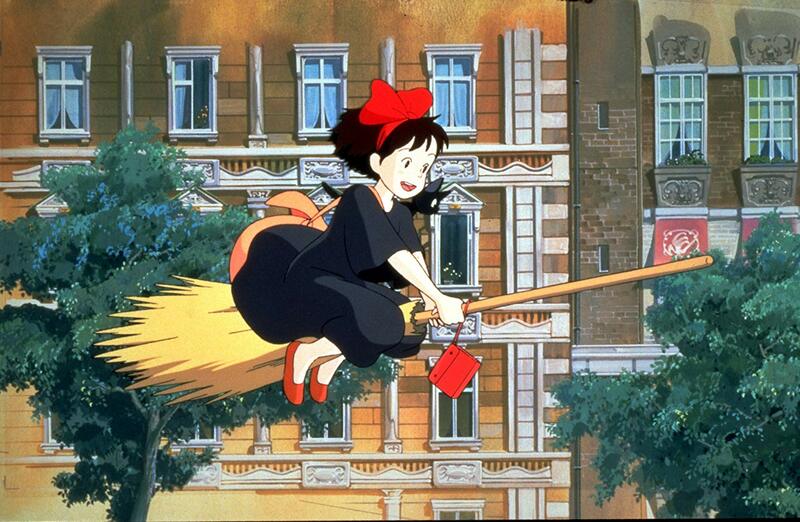 Kiki’s Delivery Service has a simple beauty in its story – it is the story of a young witch’s maturation. 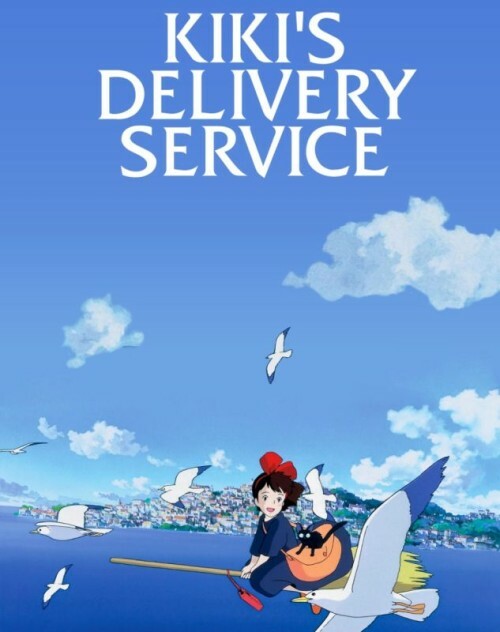 If only the kids addicted to the massively overrated Harry Potter series could have tuned into Kiki’s Delivery Service instead – Kiki’s Delivery Service far outstrips Harry Potter books and especially the films by light years. While the Harry Potter films seem only capable of throwing special effects at audiences, Kiki’s Delivery Service has a genuine emotional depth. There are times here that Hayao Miyazaki discovers a cinematic magic that can make you sing with joy – the scene where Kiki flies among a flock of geese is one such moment. The plot is relatively simple and episodic, however each of the episodes that Hayao Miyazaki involves us in has a magic – the utterly charming sequence where she must substitute her cat Jiji for a toy that she has dropped, Jiji’s terror at being tossed into a household with a dog (something that is denoted only by the blinking of his eyes), contrasted with the hitches that get in the way of her trying to find Jiji – having to wash a floor, then sew the toy back up – before the lovely scene where the dog hands Jiji to her in its mouth. There is an equally beautiful and heart-rendering sequence where Kiki goes to the old ladies, helps them cook a pie in the coal fire oven then flies with it through the rain to deliver it to their daughter, only to be rejected at the door by the daughter, during which the time of her date with Tombo has slipped away and he departs. Although the most heart-rendering parts of the film is the tragic sadness with which Kiki finds that she can no longer fly and where Jiji appears to just be becoming a normal cat, and her pained and agonising attempts to get the broom to take off again. Hayao Miyazaki invests complex, painful adult emotions in his ostensibly children’s films like no other animator does. Kiki’s Delivery Service is clearly a film that comes from Miyazaki’s heart more so than usual – the pain of Kiki’s thinking that she has lost her abilities and the search for the places where magic come from seems very heartfelt. Indeed, substitute animation for magic and Kiki’s Delivery Service becomes a film that is all about finding the inspiration to create from the heart and overcoming artist’s block. 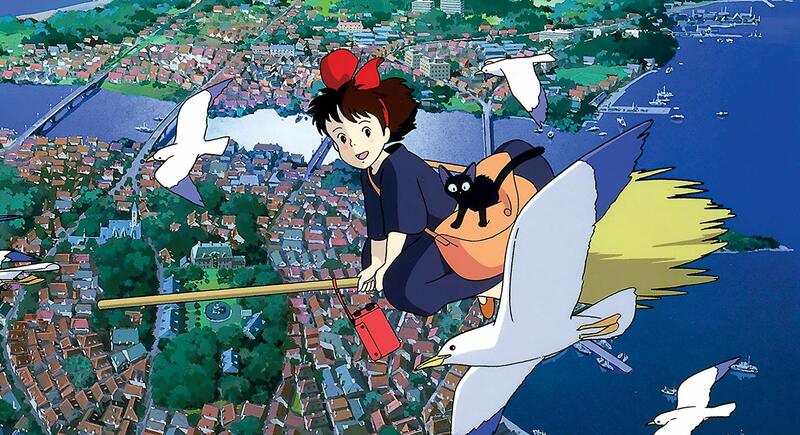 Kiki’s Delivery Service (2014) was a live-action remake from Takashi Shimizu. Both films are based on a series of Young Adult books by Eiko Kadono.